. . . Time grabs you by the wrist, directs you where to go. It’s that time of year again when all the graduates are preparing for the next step, and their parents are getting weepy eyed thinking about how fast their kiddos grew up (which, by the way, also means we are one year older and saggier)!! 2) In 1999, the week before my brother Matthew was killed, this was his graduation song from high school. To this day, every time it comes on the radio I feel like it’s Matt sending me encouragement and love. Almost 9 months ago I was pondering whether to do something more with my blog. During that time I heard Time of Your Life on the radio 3 times in two days (just randomly playing on the radio, not from my iPod). So, I took it as a sign . . . to fill my already overflowing plate with one more BIG thing (of course, as you'll read, I didn't actually keep it to ONE thing because, well, I'm mommy and I don't ever do just ONE thing)! Which one is the mommy shoe and which one is the child shoe?? EEEEEK! Where did my baby go? 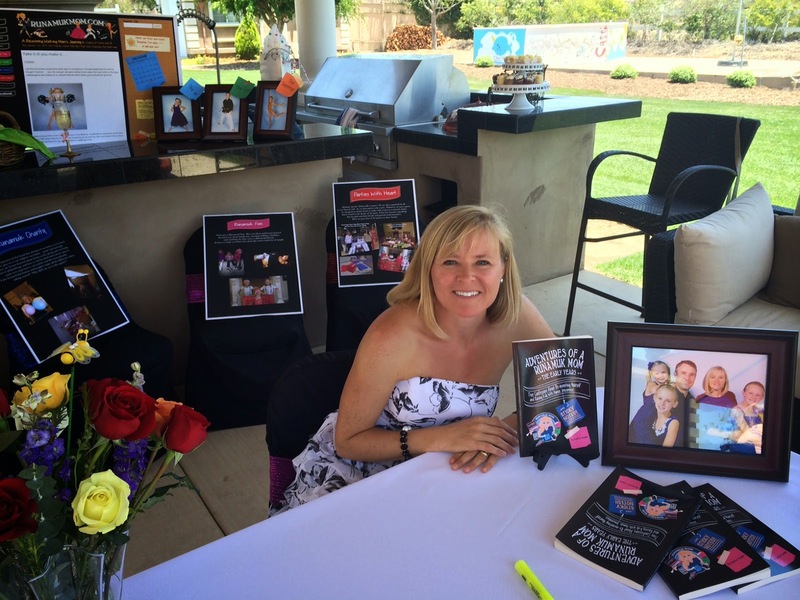 I also decided to “graduate” – and share my new status of author and mommy blogger with her very own website. 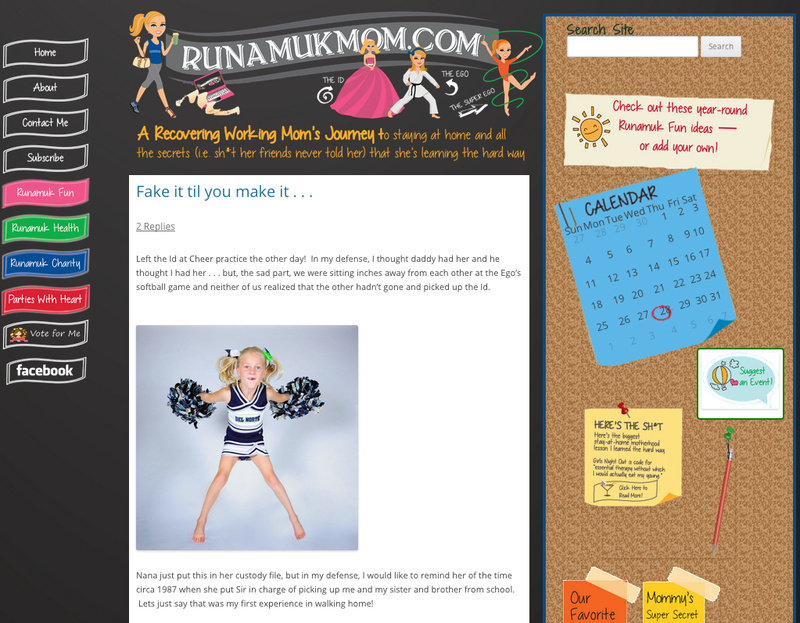 My new website www.runamukmom.com will be where I make all my new posts. It also has all my previous blog posts as well as all my lists, tips and tricks that I’ve shared along the way. These lists are for everything from dealing with lice to taking care of post childbirth lady parts to how to enjoy the “Happiest Place on Earth” without wanting to poke the eyes out of a life size Mouse! 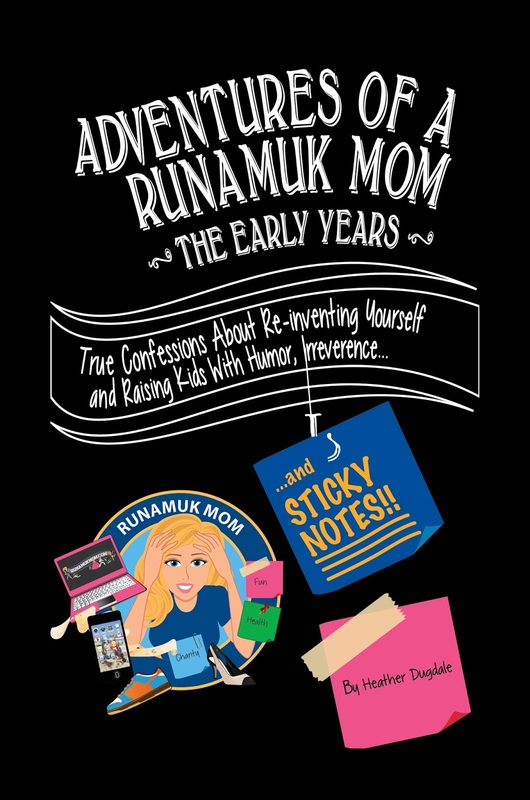 The book – Adventuresof a Runamuk Mom, The Early Years . . . 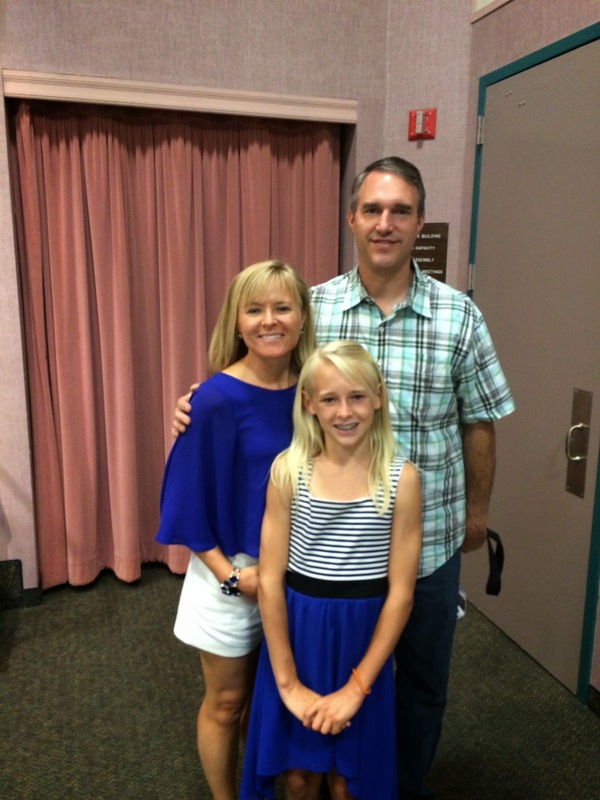 True Confessions about Re-inventingYourself and Raising Kids with Humor, Irreverence . . . and Sticky Notes has all of the recoveringworkingmom.com’s greatest hits and then some!! In other words, in actual print it contains all the sh*t I learned the hard way about being a quasi stay at home mom! I will warn you that in it I say “sh*t” A LOT!! Of course, in a fashion reserved only for mommies as crazy as me, I decided to launch all of this the same week the Superego had a major talent show performance (that required mommy to be at school for 10 hours for 2 days), AND the same week she graduated from 6th grade! 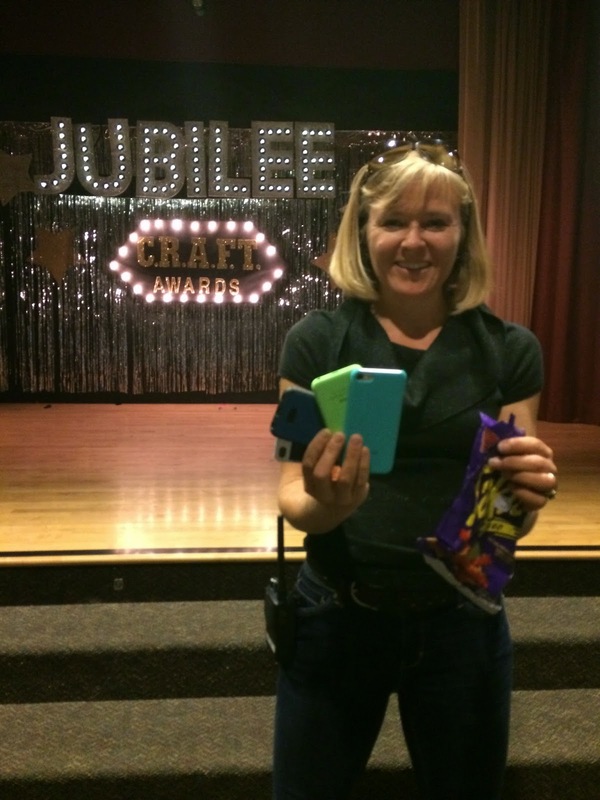 1) When you tell 12 year-old boys “no electronics” in the dressing room of the 6th grade talent show performance, they will hear “no electronics, UNLESS they are my electronics – then I can bring them onto the stage with me and instagram pictures while we are all waiting to go on stage”. Confiscated 5 cell phones (one not pictured as it had already been given to a family member) and 1 bag of Taki's - you know, those f*&#ing snacks that turn your fingers red!!! That sh*t is worse than cheetos and these boys had WHITE COSTUMES!!! Those sneaky little f*&#ers. I’d love to say that I anticipated that they were going to do that and I was on top of taking their electronics away, but it wasn’t until ¼ of the way through show SEVEN that I saw the electronics and realized I should take them away. Somehow we just hope we can give our kids common sense and they will follow instructions. Now who’s the dumb@$$???? For the Ego’s 6th grade year, I’m just going to give each of the boys a lobotomy and call it good. But, in the boys defense, I can’t say it was just the boys who acted up. When I saw one of the girls with a Tootsie Pop in her mouth while waiting backstage to go on and SING, I about lost my sh*t too! Although now I’ve decided that next time that happens, I’m going to let her go on stage and get that sh*t stuck in her hair!! 2) When you are rushing and you realize the night before that your child has to make cupcakes for her Girl Scout troop, PAY ATTENTION when she is making said cupcakes. 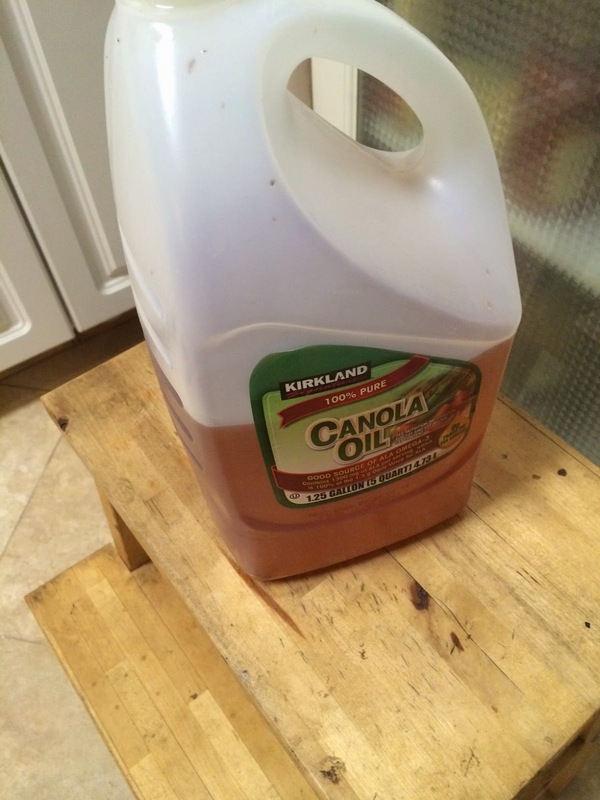 For if you do not, it will not be until too late that you realize that when she said “hey mom, is Canola Oil like vegetable oil” the “canola oil” she was asking about is actually your husband’s fry oil that he uses to make hush puppies, French fries and everything in between! 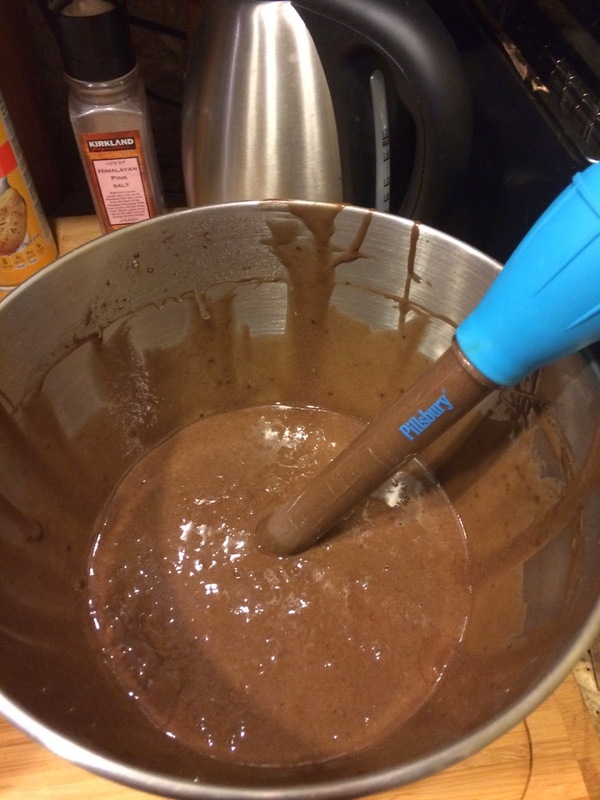 Girlfriend put ½ cup of that sh*t into those cupcakes. Gotta give the girl props for thinkin' on her feet and using a turkey baster to fill the cupcake holders. And, of course, as I write this, I am hearing the timer go off for round two of the cupcakes that mommy then had to make while the Superego was at school! 3) When you have your book launch and your 3 year-old niece is there, make sure you write her name on the cup of lemonade you pour for her. For if you do not, you MAY find that later when you hand her the cup you thought was hers you say to your friends and family “I think I may have given the baby some lemonade with champagne.” I’m not outing who might have done this, but lets just say I’m glad it wasn’t me and that one isn’t going into the custody file Nana already has on me! 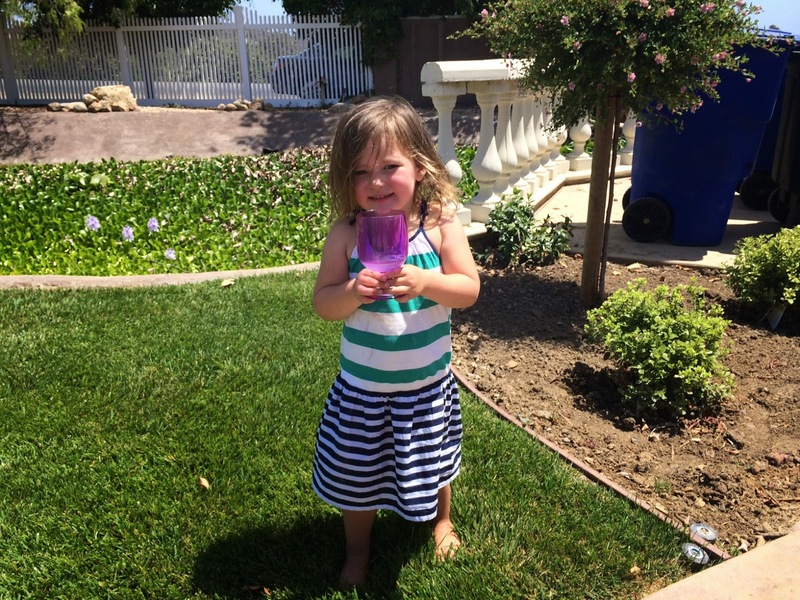 4) DO NOT leave your youngest child unattended with her sisters during your party! For if you do, after the party you MAY find that she has painted herself like a Wringling Bros’ clown!! Talk about a glimpse into the future!! Yikes! I'm having visions of a 16 year-old Id right now!!! 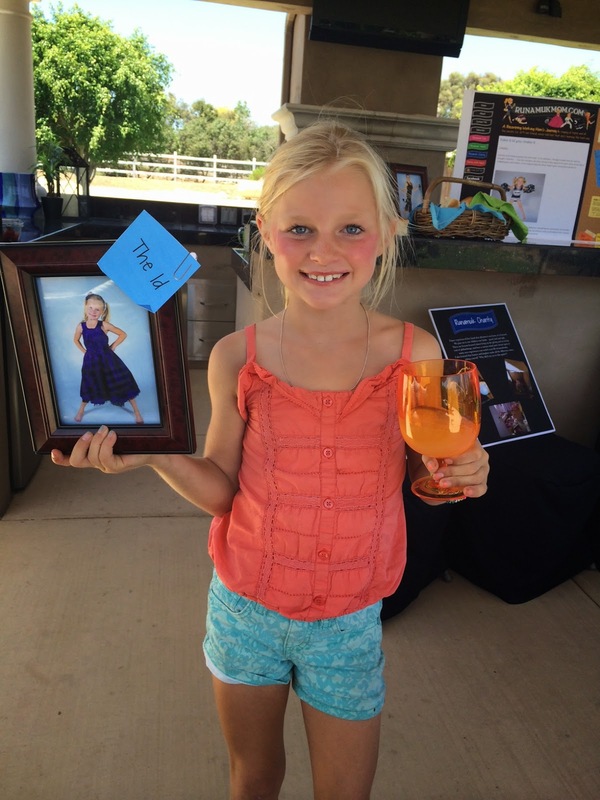 And no, her glass does NOT contain champagne. 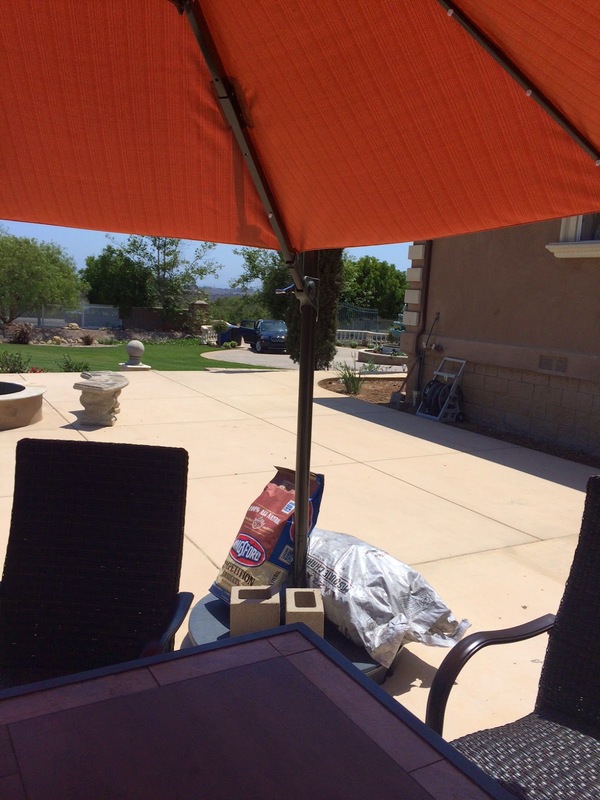 5) When hosting your nice party, don't forget to bring out all your white trash items to help hold the f*&#ing umbrella down! God Bless Husband from Heaven who was trying to help me not knock out one of my guests. But, next time, I'm gonna purchase some, shall we say, more attractive items to hold down the umbrella (of course, HfH is thinking right now - "hell no, we're not paying one dime for something I can fix all by myself. Just give me some cement and duct tape and I got this"). 6) When deciding to write a book, DO NOT say to yourself “this can’t be so hard, it’s just a compilation of material I’ve already written”. For if you do, you will actually find out just how MANY 5 am wake up calls, e-mails and phone calls it takes to make this thing a reality. NINE months ago I started this project and I already had all the content. Anyone who tells you it’s easy to write a book is sniffing too much glue! Just like childbirth, this has been one of the toughest projects I have ever done. But at the end of it, I have something that I absolutely love and it has been fun and rewarding (and of course with this one I don't have to sacrifice my body parts)! And on that note, this is my last post on www.recoveringworkingmom.com (and my first official one on www.runamukmom.com - I apologize if you received it twice) From now on all my posts will be on www.runamukmom.com. If you are not subscribed to the new website, you can do so by clicking here. And if you would like a copy (or 10 copies - Haaaa!) of my book, you can get it here direct from my publisher www.createspace.com OR you can get it here on Amazon (how cool is that??!!). Please share this with friends and family too!!! And regardless of where you buy it, please help me out on Amazon by giving it a 5 star review. If you don’t feel you can give it 5 stars, pretend you never read this and have no idea how to find the book!! HAAAAA! Thank you again for making all this possible and supporting me along the way. Can’t wait for what else the universe has in store (I have a feeling it's going to be some pretty big sh*t because we are entering middle school after all).